a shell and element design (fig. 5-8). However, most filters used today are of the spin-on type, which allows for faster change out since the complete filter is a throwaway. 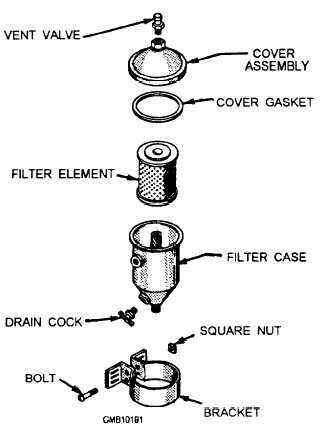 Fuel filter elements or cartridges should be replaced at the recommended interval designated by the manufacturer's service manual. Should the engine run rough after a fuel filter change, it is likely that air is trapped in the system. Bleed all air from the filter by loosening the bleed screw. In the absence of a bleed screw, individually loosen the fuel lines until all air has been vented. Figure 5-8. - Fuel filter assembly with replaceable element. The first stage of the fuel filter/water separator uses a pleated paper element to change water particles into large enough droplets that will fall by gravity to a water sump at the bottom of the filter. The second stage is made of silicone-treated nylon that acts as a safety device to prevent small particles of water that avoid the first stage from passing into the engine. Fuel injection pumps must be supplied with fuel under pressure because they have insufficient suction ability. All diesel injection systems require a supply pump to transfer fuel from the supply tank through the filters and lines to the injection pump. Supply pumps can be either external or internal to the injection pump. The two types of supply pumps used on diesel engines today are the gear type and the vane type. The remaining task to be accomplished by the fuel system is to provide the proper quantity of fuel to the cylinders of the engine. This is done differently by each manufacturer and is referred to as FUEL INJECTION. Q1. What grade of diesel fuel is used in warm and moderate climates? Q2. What determines the lowest temperature at which diesel fuel can be pumped through the system? Q3. What is the most important characteristic of diesel fuel? Q4. What combustion chamber is designed principally for the use in the multifuel engine? Q5. What term is used to indicate the zero-droop capability of a governor? Q6. What type of governor uses a magnetic speed pickup to monitor the rpm of the engine? Q7. What component in a hydraulic governor provides power to move the throttle of the engine?